I often find myself inspired by the home décor captured in our magazines. Peering into a person’s home tells a special kind of story. The color palette, the textures of the fabrics, the shape of the furniture—each element is a clue into what the homeowners love, where they’ve been, and what sets them at ease. Those pieces offer useful ideas that we can often translate into our own homes. I’m especially impressed by the way well-curated collections lend personality and interest to a space. A mix of something like antique and collectible thimbles, for instance, reveals a beloved hobby as well as the places someone has traveled. Even the quirky ones from a tourist shop make a fun little statement. At the same time, those elements soften a space and make it unique. You’re familiar with my love for blue and white; finding a new piece of antique china is always exciting. Even if I don’t purchase it, I love keeping an eye out for the special things I feel connected to. There’s a thrill in the hunt for a collector. That’s why I so enjoyed the section on collectibles included in Cottage Kitchens, the new special issue from The Cottage Journal. 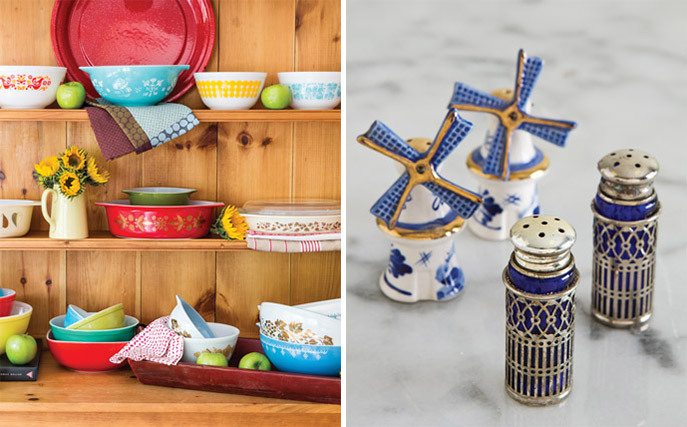 They offer an informative look at a few classic collectibles, including vintage Pyrex and unique salt and pepper shakers. 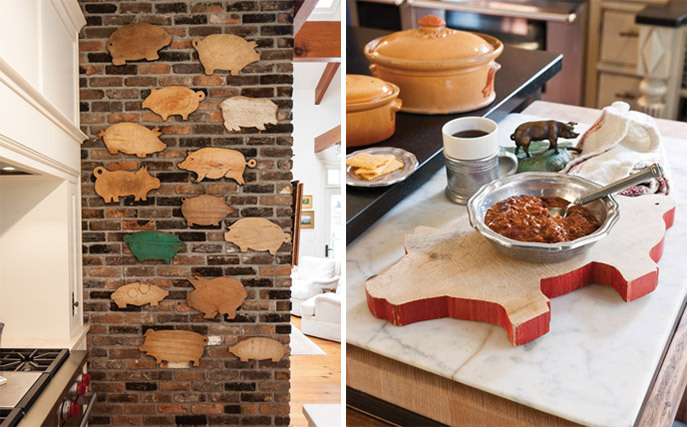 There’s even a selection of pig-shaped cutting boards, which made for a rustic addition in one cottage kitchen. I learned more than a few interesting facts, too. 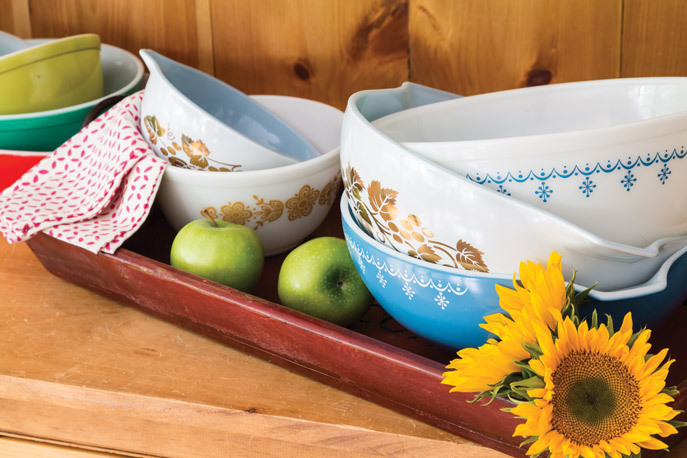 Did you know that Pyrex began as glass inserts to railroad lanterns? If you’re a collector, I’m sure you did. The collector is always a special kind of expert, adding to her knowledge as she acquires a new item. What do you love to collect? It was so much fun to read about the variety of collections your readers have that I just had to add mine to the mix. When I was seventeen I was given an old bowl with dainty violets on it that had belonged to my best friend’s grandmother. Thus started my collection of “violet” china. It took a long while to get started collecting as I was married young (51 years and still going) and not much money for extras in the early days. Now I have quite the collection and enjoy hosting brunches for the girls using all of my violet strewn china and serving tea and coffee in the dainty cups. Thank you for this marvelous blog as every post is inspiring. I collect House of Webster Briar Rose pieces. I have had so much fun looking for each piece in various areas of Texas. Memories of days gone by…In 1956 I was a 13 year old girl living on the edge of a rural town of about 200 people. In town there was an ancient store, The Farmer’s Mercantile. It sold a bit of everything you could ever need. On one visit, I discovered a new set of 3 Pyrex round, covered casseroles. The largest and the smallest had pink exteriors with a white gooseberry design. The mid-sized one was reverse-white with pink design. All had a white interior and a clear lid. I thought they were the most beautiful things I had ever seen! I did not receive an allowance, but Dad gave me $1.25 every Monday morning during the school year for lunch money. I wanted those casseroles so badly, I sacrificed lunch almost every day for months to save enough money to buy them. I think the selling price was about $12 for the set. I went into the store every few days to see if they were there! On one visit the store owner’s wife noticed that I was looking at them and commented about it. I told her I was saving my money to buy them and hoped they wouldn’t sell before I had enough. My parents, like most of the towns’ people had a “charge account” there. Imagine my delighted surprise when she kindly offered to put them aside for ME until I had saved enough! When I finally brought them home they were the second items I added to my “hope chest” along side a beautiful handmade quilt from my paternal grandmother. I still have all 6 pieces, undamaged, despite years of use. I did stop using them about 10 years ago, thinking maybe someday one of my nieces or grand nieces might like to have them. Thanks, Phyllis, for waking up an old memory of my youth! So funny to see the Pyrex bowls as collectibles. When our family moved across country when I was young and in college, the movers broke some of my mother’s pink and green depression glass bowls. They replaced them with some of those “modern” style yellow/orange floral Pyrex bowls. I have been collecting” pineapples” for over 40 years! I love what they represent, welcome and hosptality! They adorn upholstery, wallpaper even garden statuary too many items to list here. At Christmas I decorate the entire house with fresh pineapples, including a blown glass pineapple at the top of our Christmas tree. It has become my signature. The best result of my collecting is that friends and family tell me they think of me every time they see a pineapple! Love your blog how fun! I collect blue & white dishes & love flow blue. I also collect vintage silver; especially the engraved trays. I have a nice collection of crystal pieces & majolica plates in green. I particularly love antiques & go to the Round Top antique show every spring. It is in Round Top, Texas & so much fun. Estate sales are in abundance, & I find many collectibles there! Dear Phyllis, I so enjoy your blogs. This one is special as it reminded me of a time when a friend and I went to the Mall and they were having an Antique show. We were so surprised to notice so many antiques that looked like what we had in our hutches and had received as wedding gifts many years ago. My husband and I have been married almost 65 years. I collected tea pots and bone china cups and saucers. I guess mostly all my nice pieces are all antiques including us. Hi,i collect all white milk glass from Fenton and Westmoreland co ,also ironstone wih cobalt designs,pyrex mixing bowls and casserole dishes,Hull magnolia pieces,Roseville pinecone and roseville florentine made in the 1930s.Love th photo of the pyrex pieces. I collect thimbles & small sewing notions. These are easy to find & carry when traveling to various destinations which bring back memories of a specific place. I also look for them at antique stores, flea markets, etc. Since friends & family know I enjoy this, they often gift me with a thimble they have found. Vintage sterling flatware. The pattern speaks to me and I have to collect at least one complete place setting, if not more. China, my poor husband indulges me when I say it’s time to change out every month or so. For the holidays, we take pictures not to duplicate. My husband joins in, with a passion for glass ladles. New patterns or old, it just has to make me feel it. Love your blogs. So interesting to read about all the things that people collect and I really hope you will start again about collecting in Victoria magazine as you did in the early days,so much fun to know what people love about collecting and the hunt for these lovely treasures. I also collect many things,but my favourite ones are antique silver baby rattles and portrait miniatures from children with a rattle. And I have a beautiful collection antique silver and gold thread winders,they are really a work of art with the most beautiful engravings on it,but very hard to find here in The Netherlands. I’m always looking for Antique postcards with Easter and Christmas greetings on it,that I use for making my ornaments,and also many other things like German glass ornaments,trims,ribbons,tinsel,monograms,die cut scraps etc.to use for my ornaments. Its so much fun to go to fleamarkets and antique shows to see if I can find anything,and my husband likes it also to go with my on my hunt for treasures,he collects Antique silver trowels used for the first stone laying at big old houses and churches etc. Sometimes at a auction he finds a trowel,and we always try to see the house for real if the addres is our country and we try to know more about the person and the special occasion when the trowel was presented. Phyllis I love seeing what others collect, so interesting!! Antique Pyrex? They were shower gifts when I married 56 years ago at the tender age of 19! Still have a few. What an interesting article on the collections we love in our lives. I personally collect the books of Grace Livingston Hill (1865-1947). 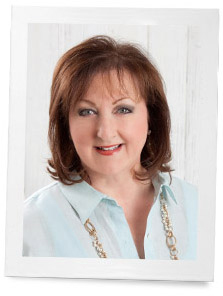 She is known today as The Queen of Christian Romance. She was an American novelist who sold over a million novels in her lifetime. A very popular author, Hill published hundreds of inspirational novels and short stories. Many of her books have been republished, and are blessings today to both readers and collectors. THANK YOU for reminding us of how our collections are so meaningful to us. I collect silver sugar spoons, and tea pots and willow ware. What don’t I collect.!!!! I was fortunate to be in the moving and storage industry for many years. Many of the people shipping goods were quite generous with things they no longer wanted.Over the years I accumulated many lovely things. I enjoy all of the beautiful pieces of history that I have. I collect tea cups…I inherited many from my grandmother and mother and have added to the collection with purchases from antique shops. I also have quite the assortment of tea pots. Let’s just say I’m over the moon with anything to do with tea!! Pitchers and teapots of all sizes and materials fascinate me, especially the miniatures. Antique books overflow my wall-covering book cases with Poetry, Southern History, Ireland and Classics. I keep files of rare, unusual and/or amusing personal and place names. Other collections of clippings and quotations are Natural Beauty, Bravery and Broken Hearts, Water in All Its Guises, Strange Stuff and Odd Dogs and The Human Brain. (Brain surgery in 1993 ago set that off). Collections spark memories and satisfy our desire to honor and remember what we love and give tangible forms to our responses. I can never trash a card or letter with “Love” written on it. I collect the white with green rimmed 1940 ~ 1950’s Restaurant Ware. Also, I’ve begun an English Johnson Brothers and Sheffield Bone White USA swirled white dinnerware. One of my favorites, my collection of white pottery vases, many unmarked. I’m always on the hunt to add a few more pieces to my turquoise pottery vases, as well. Vintage books are another of my weaknesses. Silver trays make me weak in the knees. Those are just a few of my favorite things to collect!!! Thank you for such an inspiring posts!!! Corning NY, where Pyrex originated, has a big display and show celebrating the 100 year anniversary of Pyrex. It is very interesting and worth the time. Love those vintage dishes. I also collect red transferware, ironstone and pink depression glass. Oh my goodness! What DON’T I collect may be the better question! Among my favorites: antique & vintage linens, antiqye & vintage beaded and mesh handbags, religious relics, miniature books, dishes……..
Phyllis, as an antique lover, I adore collections. As a young bride of just 19, I collected pig cutting boards and ducks. As my passion for antiques grew, my collections up-scaled a little, with my favorites being red transferware, silver napkin rings, and antique books. ( there are so many more, that’s one of the reasons I became an antique dealer) Collections make a house a warm, inviting home, they really do show the owner’s personality.